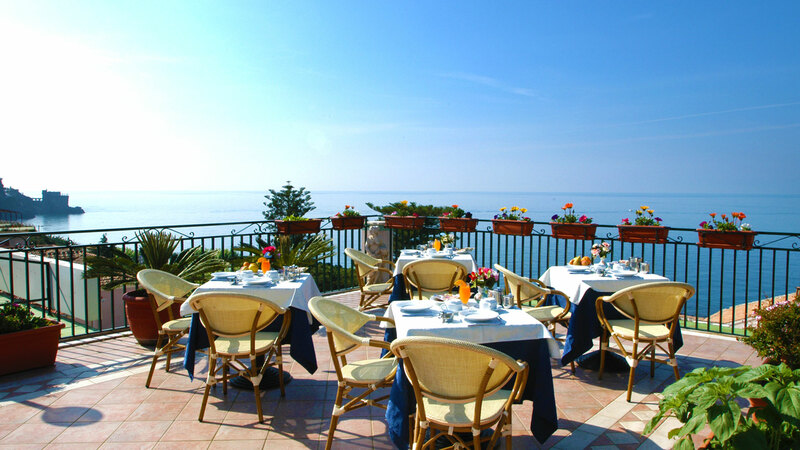 The Hotel Baia Verde is one of the oldest family-run hotel on the Amalfi Coast which gives you a true taste of the real Italian hospitality. Since 1974, the Buonocore Family takes care of the tourists who choose Maiori to spend their holidays at sea, welcoming them in a pretty guest house with a panoramic view. Centrally located in the heart of Maiori, just 50 meters from the beach, the Hotel Baia Verde occupies the top three floors of a modern building equipped with elevator. The rooms are on the fourth and fifth floor, while the sixth floor hosts the dining room and the sea view terrace where breakfast is served. Here you can enjoy authentic Italian cuisine and quiet ambiance! In addition, from our large terrace, you can admire the ancient Norman Tower and the wonderful Miramare Castle. By car from north Italy: get on the motorway A1 Milan-Naples, continue to the motorway A3 Naples-Salerno and take exit Vietri sul Mare. Vietri sul Mare is 15,8 kilometers from Maiori. The journey time is approximately 18 minutes. By car from south Italy: get on the motorway A2 Autostrada del Mediterraneo, take exit Salerno and follow directions to the Amalfi Coast. Down the road you’ll reach the State Road 163 and therefore Vietri sul Mare. Vietri sul Mare is 15,8 kilometers from Maiori, The journey time is approximately 18 minutes. By plane: from Naples "Capodichino" Airport you can reach Maiori renting a private shuttle bus service run by Pintour (15,00 € p.p.) or calling a taxi. From Salerno station: get out of the Station of "Piazza Vittorio Veneto" and head towards the near SITA bus stop. SITA is the name of the local transfer service that connects Salerno to Maiori. Salerno is 19,8 kilometers from Maiori. The journey time is approximately 24 minutes. To travel on buses, you need a ticket to punch on board. You can buy it in one of the official resellers shops (bars and tobacco shops). By ferry from Salerno: you can also get to Maiori by sea, with ferries or hydrofoil, directly from Salerno. The most extensive ferry service is run by Travelmar and it’s available from May to October. The dock is in front of the train station-exit. Reserve your stay at the Hotel Baia Verde! 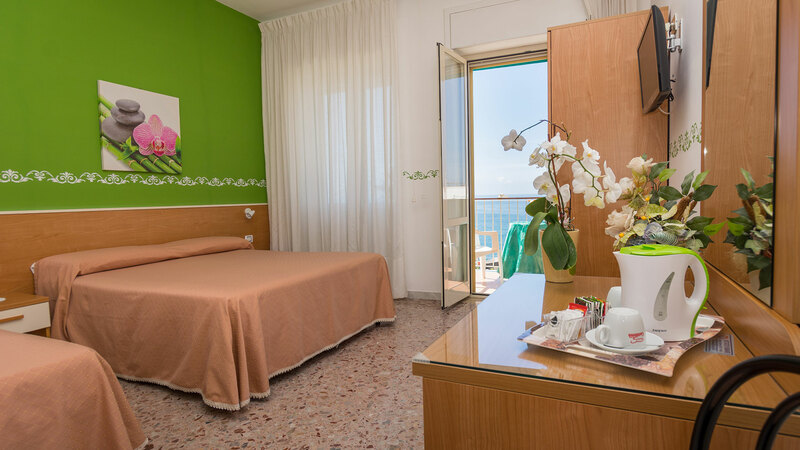 Located in a strategic position, in front of the beach and near the main square, restaurants, and activities, the hotel offers well refurbished rooms with quiet environment. If you are looking for an holiday with friends or family, the Hotel Baia Verde is the right solution for your Amalfi Coast experience. Our rooms are simple but cozy, and they are all equipped with air-conditioning, TV, telephone, private bathroom and central heating. For your stay, you can choose between a single room, a double room or a double room with extra beds. Some of them have a wonderful balcony with a frontal sea view! For room availability requests, please call us or use the availability request form. Are You Searching for a Two Stars Hotel? Good for its great position to visit Maiori and the other villages of the Amalfi Coast, the Hotel Baia Verde will welcome you for a lovely break, a weekend or a long stay. Our family-run hotel is a very convenient choice for every occasion. The main services provided by the hotel are: front desk staff available 24 hours a day, a special breakfast overlooking the sea, the Wi-Fi available in the common areas, a careful cleaning staff, a magical sea view terrace and a private parking located few meters from the hotel. The seasonal rates of the Hotel Baia Verde vary according to the time of year. In addition to the summer period, there are other special times during which the tourist arrivals increase: Christmas, New Year, Easter and the first of May. The hotel offers you the possibility to include, or exclude the breakfast. 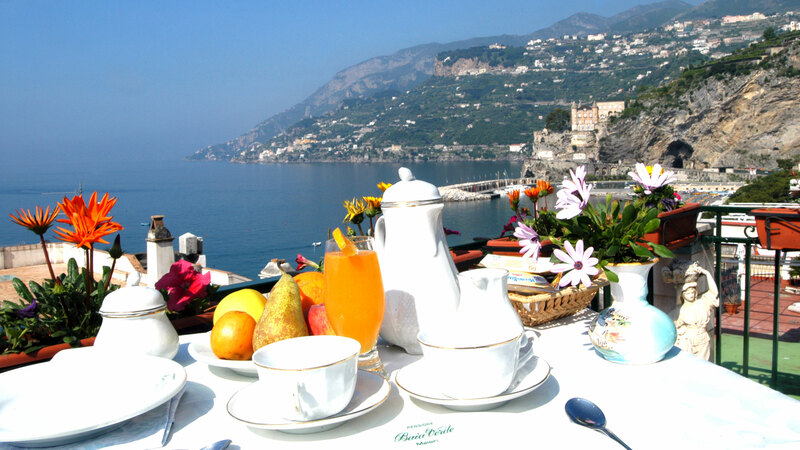 We also propose an half board service to taste the traditional food of the Amalfi Coast. Maiori is a beautiful village on the sea, rich in monuments, architectural and natural beauties. Nestled in a picturesque corner of the Amalfi Coast, it is also a good starting point to explore the most popular tourist destinations nearby, such as Positano, Ravello and Amalfi, for example. You can visit them planning tours and excursions by land or by sea. The options are as follows: rent a private car or bus with the Pintour company; use the SITA public transport buses (the bus stop is only 30 meters from the Hotel); enjoy ferry transport services provided by Travelmar, departing from the Port of Maiori (it's just a 6 minutes walk from the Hotel). Transfers by sea are available from May to October. 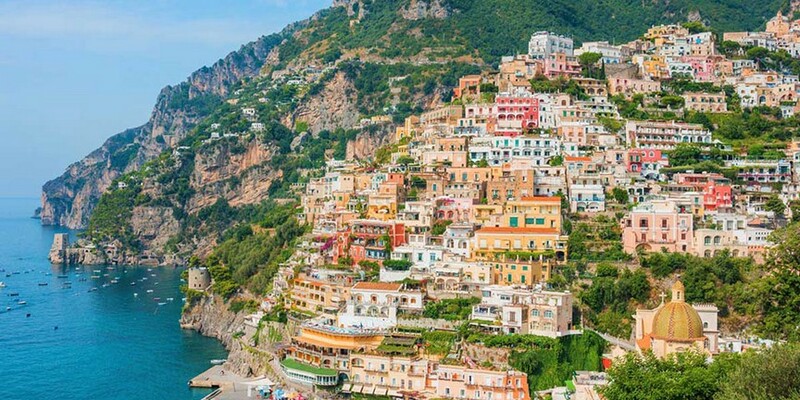 Located 25 kilometers outside of Maiori, Positano is the real pearl of the Amalfi Coast. It’s a picturesque suburb famous for its stylish boutiques, romantic beaches and colourful houses overlooking the sea. Reach Positano by car, bus or by ferry! 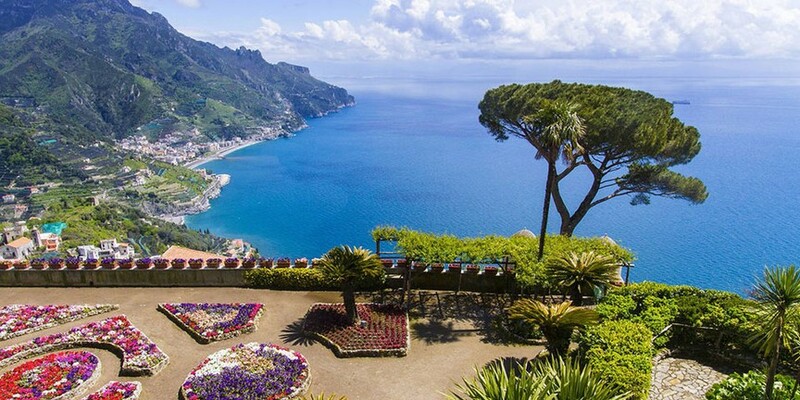 Located 10 kilometers outside of Maiori and nestled amongst the foothills of the Monti Lattari, Ravello is based at 374 meters on the sea level. Villa Cimbrone and Villa Rufolo are must-see attractions. Reach Ravello by car or by bus! 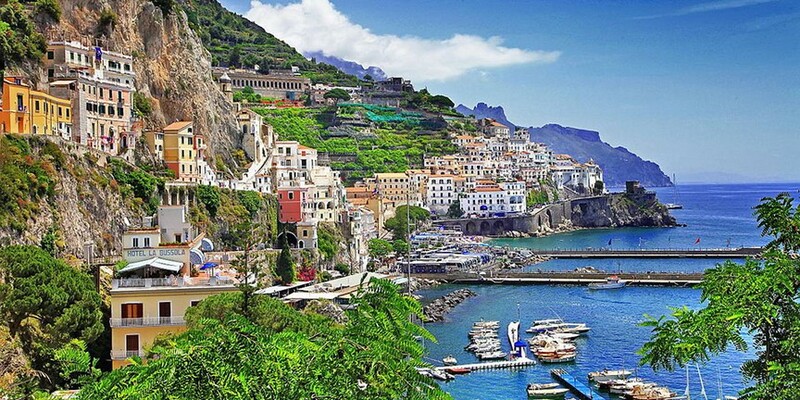 Located 6 kilometers outside of Maiori, Amalfi is the town that gives its name to the whole coast. You must visit the Cathedral of St.Andrew, a 9th-century Roman Catholic church in the Piazza del Duomo. Reach Amalfi by car, bus or by ferry! How to Visit the Amalfi Coast? Plan with us your trips! Complete the following form to contact our staff and send to the Hotel your free quote. We will reply by email as soon as possible. When you book directly with us, you always get the best rates available! Under the law 675/96 we inform you that the data will be used for internal use only and will not be disclosed or sold to another entity.